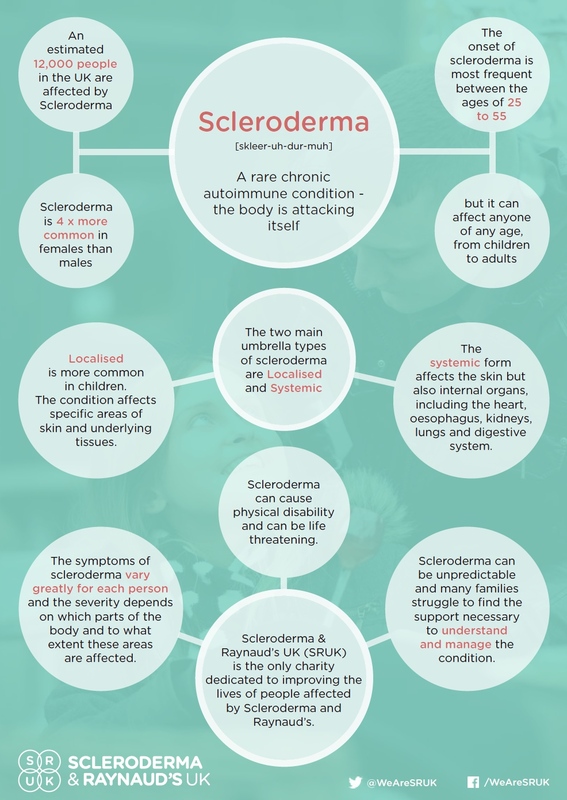 Scleroderma is a rare, chronic disease of the immune system, blood vessels and connective tissue. 2.5 million people worldwide have scleroderma, and in the UK there are 19,000 people diagnosed. It is an autoimmune condition, meaning the immune system becomes overactive and attacks healthy tissue in the body. The name of the condition comes from the Greek, 'sclero' for hard, and 'derma' for skin. This hardening of the skin can be one of the first noticeable symptoms of the condition, as the body produces too much collagen. This excess of collagen can affect the skin, joints, tendons and internal organs. It causes scarring and stops the affected parts of the body from functioning normally. The symptoms of scleroderma vary for each person, and the severity depends greatly on which parts of the body are affected. Usual symptoms include hardening of the skin, swelling of the hands and feet, joint pain and stiffness and blood vessel damage leading to a physical over-reaction to cold or stress, called Raynauds' Syndrome. 'Morphea' is the name given to localised patches of hardened skin that are smooth and shiny. Usually they appear on the trunk, but they can affect any part of the body. They are painless and there are normally no other problems or symptoms. In 'Linear' scleroderma the skin affected is in a line, usually along an arm or leg. The skin appears shiny, miscoloured or scarred, and often feels tight and uncomfortable. In children, it has to be monitored carefully as the normal growth of limbs can be affected. In this type of scleroderma the internal organs are affected as well as the skin. The heart, oesophagus, blood vessels, kidneys, lungs, blood pressure and digestive system can all be involved. There are two kinds of systemic sclerosis. People with limited systemic sclerosis have normally lived with Raynaud's syndrome for a long time. The condition progresses gradually, and usually only affects the face, hands, arms below the elbow, feet and legs below the knees - although the lungs and digestive system may be affected over time. Symptoms can include thickening of the skin, heartburn and problems with swallowing. In diffuse systemic sclerosis, it is more likely that the whole body will be affected, and in some cases there can be potentially serious complications involving the heart, lungs and kidneys. Common symptoms include fatigue, joint pain, and stiffness. Download the systemic sclerosis factsheet. 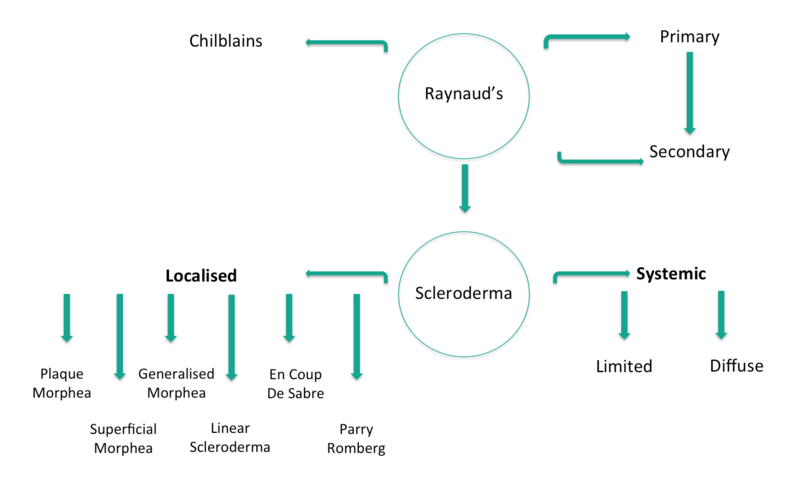 There are different types of Raynaud's and Scleroderma. The diagram below show these types and the categories they sit within. Here are some key facts on scleroderma.